Unique mehndi designs are something every Indian bride is looking for. 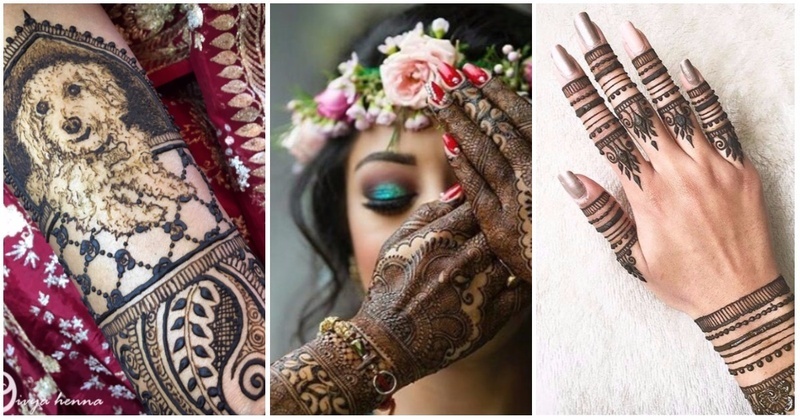 While the usual floral swirls are pretty themselves, we found some cool new mehndi designs that are creative, gorgeous and perfect for a modern 2017 bride to flaunt at her Big Fat Indian Wedding! This bride got a picture of her pup as a mehndi design for her wedding. Divya Henna is one talented mehndi artist! Bride Arati wanted something similar but not the same. She got the Vancouver and Toronto skyline, each representing where she and her fiance are from. Mehndi by Munira’s Mehndi! Another skyline picture by Divya Henna. This one has details like Starbucks coffee, music notes, sunflowers and even a mustache. All symbolising moments between the bride and her fiance. How cute! Finger mehndi is something I personally love. Bridal mehndi designs are usually all about going heavy, but minimalism looks just as gorgeous - especially when you can trust your wedding jewellery to balance it out. This bride went all out with her mehndi. Love all the details in this picture. Another not-bridal mehndi that all brides should try!! By Bella Henna. White mehndi is not usually found amongst Indian brides but this bride here shows us that you can pull it off with the right design and have it look great. Another white mehndi design by Hiffyraja. How amazing would this back mehndi design look with a deep-cut blouse?! What about metallic mehndi? If you’re trying this one out, minimal is the way to go!